Biostar announced the TA990FXE motherboard for AMD's FX processors. BIOSTAR Group, a world famous manufacturer of motherboards, graphics cards, industrial computing systems and computer peripherals, proudly announces the TA990FXE motherboard aimed at the most demanding overclockers and gamers. The TA990FXE is made in the ATX form-factor on the flagship AMD 990FX chipset in combination with the most advanced SB950 Southbridge which guarantees the support of the latest technologies and ensures the unprecedented performance. The board supports all Socket AM3+ based Phenom II X6, Phenom II X4, Phenom II X3, Phenom II X2, Athlon II X4, Athlon II X3, Athlon II X2 and Sempron CPUs including top 6-core and 8-core AMD FX, AMD Phenom II and AMD Athlon II chips with the maximum thermal design up to 140W. The board is equipped with four DDR3 DIMM slots and supports up to 16GB of dual-channel DDR3 800/1066/1333/1600/1866 MHz RAM as well as overclocking versions up to 2000 MHz. 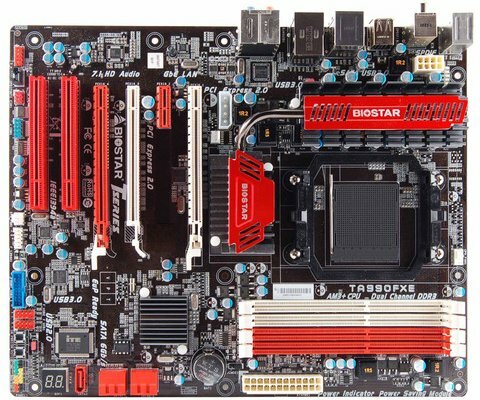 Today’s market features few motherboards equipped with three PCI-E x16 2.0 slots, and the TA990FXE is one of few boards supporting their configuration of x16, x16, x4. It actually means the support for the most complex graphics configurations based on several graphics cards. Additional peripherals are realized with two PCI slots and one PCI-E x1 2.0. The board features a great deal of interfaces and peripheral controllers. It sports five SATA3 6Gbit/s slots supporting SATA RAID 0,1,5,10, three USB 3.0 ports, six USB 2.0 ports, FireWire IEEE 1394a, 10/100/1000 Mbit/s LAN and 8-channel HD Audio. There is also a bracket for a serial port and a connector for an external eSATA2 3 Gbit/s interface. The TA990FXE board comes with modern high-quality solid capacitors and is ready to run stably under the latest Windows 7 family OSes. The board supports the maximum list of BIOSTAR’s proprietary technologies including the BIOSTAR G.P.U (Green Power Utility) for optimal power consumption at low system load, an exclusive overclocking system, the Rapid Switch for quick restart, the Rapid Debug for hardware debugging with the help of a LED light, the BIOS Flasher and the BIOS Relife for updating or recovering BIOS from a USB drive, and the BIO-Remote 2 for remote control of home media system components from Android and Apple mobile devices. Overclockers will be pleased with the T-overclocker utilities for Windows which provide fine system tuning for experienced users.